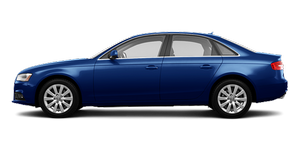 The chassis of the Audi A4 is striking with its sporty precision, high ride comfort and superior safety. The mounts of the rear suspension control arms and the characteristics of the shock absorbers have been even more finely tuned. Most of the components of the five-link front suspension and the trapezoidal-link rear suspension are made of aluminum. Another high-end feature that gives the Audi A4 a special status in its class is Audi drive select. In the basic package, the driver can switch the characteristic of the accelerator, the shift points of the automatic transmission, the power steering and the automatic air conditioning between the four modes "comfort," "auto," "dynamic" and "efficiency." If there is an onboard navigation system, the additional "individual" mode is also included. Further modules are optional - adaptive cruise control or the cruise control system, the sport differential, the suspension with damper control and dynamic steering. By means of a superposition gear, the gear ratio is adjusted in a continuously variable manner depending on the driven speed; at the handling limits small interventions compensate for understeering and oversteering. All front-wheel-drive versions of the Audi A4 feature the electronic stabilization program (ESP) with electronic limited slip differential. In dynamic driving the system further improves handling and safety by initiating minimum brake interventions at the front wheel that is subject to a reduced load on the inside of the curve. The large wheel brakes - with ventilated front and rear disks in many variants - offer excellent stopping power and can be precisely modulated. All Audi A4 variants roll off the assembly line on elegant aluminum wheels. Depending on the engine version, they are 16 or 17 inches in size; tires with optimized rolling resistance belong to the 205/60 and 225/50 series. The A4 3.0 TFSI has 18-inch wheels with 245/40 series tires. The line of options ranges to 19 inches with 255/35 series tires. Four of the 18 available wheels are new designs. The A4 allroad quattro offers four independent designs.